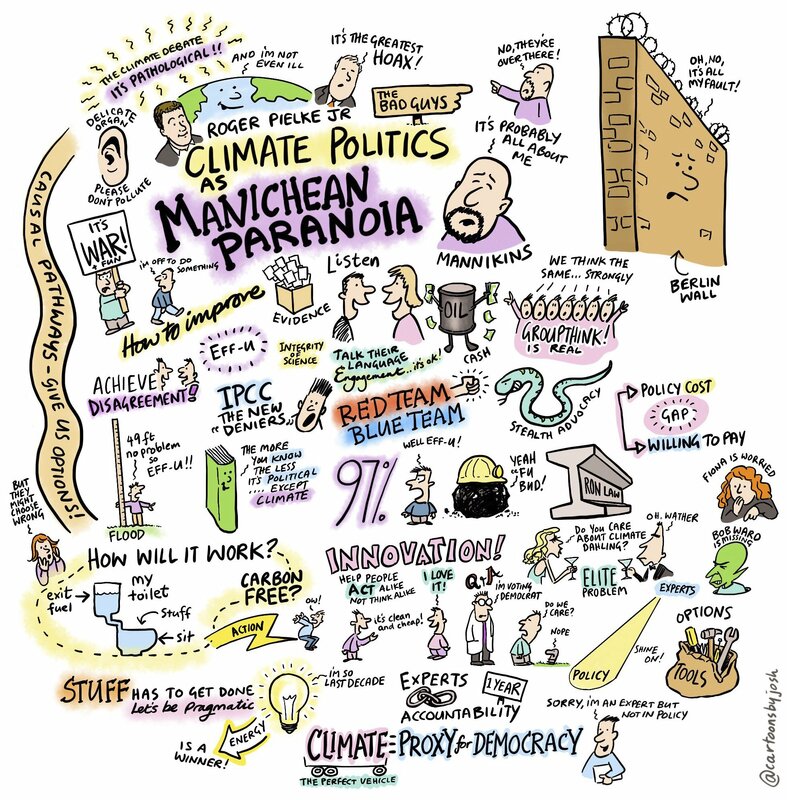 Roger Pielke Jr. gave a talk in London last night, on “Climate politics as Manichean Paranoia”. This phrase refers to the idea that “your opponent is considered to be malign and willfully ignorant, whereas your own side is noble and uniquely enlightened”, which Pielke says is one thing that unites the two sides of the climate debate. A video of the talk should be available soon. Do watch it – he’s a very good speaker and there’s a lot more that he says that’s not in the slides. There are a few little jokes as well. (“My Ferrari says Koch Bros on the license plate”). There’s also a long and interesting Q&A session at the end. Questions were asked about other problematic areas in science, why he is so optimistic, how do we make politicians pay attention, the 97% consensus issue, the balance between expertise and democracy, how to bridge polarised political divides, whether there’s any will to resolve the polarisation problem, the role of the IPCC, and more. A point he made repeatedly is that experts should act as “honest brokers” by offering politicians a range of options rather than promoting only their own preferred option. Previous post ← France: Weak Link in the Climate Maginot Line? I got my first taste of being savaged a few years ago when I asked an innocent and perfectly legitimate question about error in an on line forum after reading a paper they were discussing. Instead of getting an answer, I got a called a climate denier in the pay of big oil and found myself ejected from the group. Claiming both sides are equally bad in the debate is simply not true. If a school yard bully consistently picks on a classmate until the child is finally forced to fight back and then both are suspended by the school for “fighting”, that is hardly both sides being equally bad. That is the school staff not doing their job in stopping the bully and then finding an excuse to avoid dealing with the bully while covering up their own failure to act. I have yet to hear of any “denier” refusing to provide any data or using threats of legal action (and actual legal action in the case of Mann), in order to silence opponents. Both sides are not equally bad and saying so is just Pielke playing the stern school principal lecturing both children on why we should never use violence to settle our differences. This Manichean Paranoia is not confined to climate, but rather pervades our entire culture. It is inconsistent with a functioning democracy, and indeed we no longer have one. ” I have yet to hear of any “denier” refusing to provide any data or using threats of legal action” – then you don’t know much about it then, e.g you haven’t come across the noble Lord Christopher Monckton. 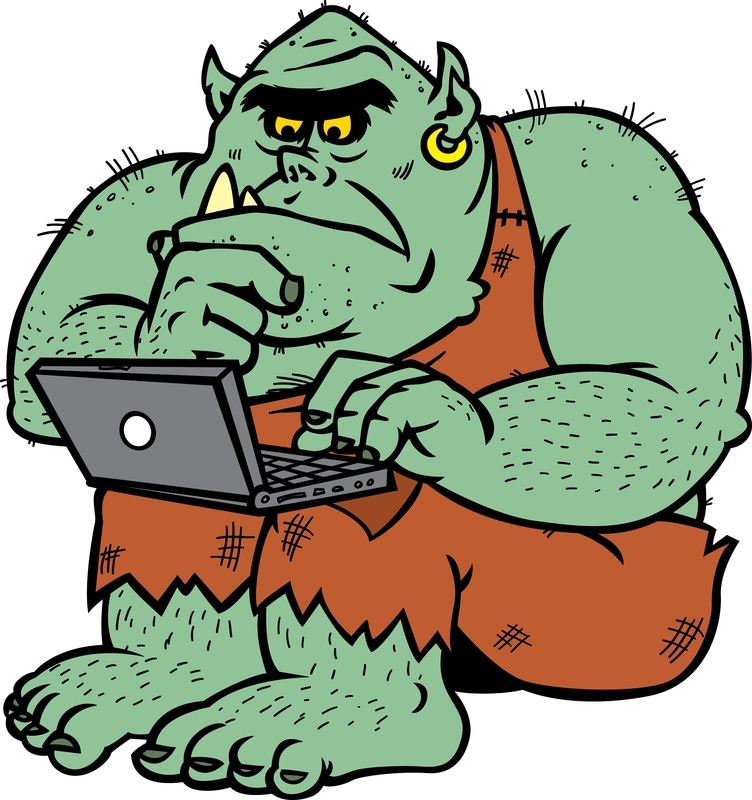 “… I asked an innocent and perfectly legitimate question about error in an on line forum after reading a paper …” – do you have a link? Even if Monckton does what you allege is he so powerful as to offset the climate hype industrial complex? In the US the founders knew that a democracy must never be allowed to devolve into a mob. And that democracies unchecked always devolve into mobs. I see your point and agree in the sense that things are certainly breaking loose. But the failure / dysfunction is pretty much a direct result of the rise of the so-called progressives in controlling academia, media and education. You imply it will end poorly and you are correct. “…maintaining the integrity of science assessments, by including minority views…” – sort of like, there’s a consensus that the sun’s core is hydrogen fusing to helium, but there’s at least one guy who maintains that its core is iron… Or, there’s a consensus that vaccination is safe and necessary, but there’s a few oddballs with no scientific qualifications who maintain that it it is dangerous… Or evolution, etc. What use would including these minority views have for anyone? I haven’t seen Roger’s presentation so can’t comment on it, however I came across an article in the Guardian of all places in which Ian Leslie discusses the fat v. sugar debate in the medical world. Very similar to the CAGW story. A hockeystick, albeit without the shaft, shows that as intake of saturated fat increases so does coronary vascular disease, so fat must have caused it. The loudest voices then proceeded to bruit this story about and when others came along to try to refute it they were, as Judy Curry explained, “thrown out of the tribe. It’s here and bears an almost unbelievably close relationship to the “climate wars”. Nothing could prove the theory wrong, despite the work of the handleless hockey stick never being replicated – ever. It’s here http://tinyurl.com/gs6hfuj. In the article he describes how the scientists gather round a theory and become what Judith called the “Tribe”. Ian Leslie, The Guardian, The Sugar Conspiracy. If he’s not describing the climate science community the moon is made of green cheese. “Minority views” like Einstein’s theory of relativity or Wegener’s tectonic theory or Marshall and Warren’s theory that bacteria were responsible for the majority of peptic ulcers – to name but three of a vast number of “minority views” that make up the basis of all of modern scientific understanding? Clearly it has escaped your attention that the vast majority of scientific paradigm shifts were scorned by buffoons like you as being “minority views”, and if the likes of you had their way, we would still be living in caves without wheels or fire. With you ill-considered provocative jibes and utter lack of understanding of anything at all, you really are the most clueless little twerp, aren’t you? It’s a fascinating phenomenon, Geronimo, but I don’t believe it applies to the epicenter of the CAGW movement. These scientists have done far more than ignore data that refutes CAGW theory and promote that which agrees. They have been shown to knowingly fake data, hide data, and rig computer models to support a theory that couldn’t possibly exist otherwise. I read nothing in The Sugar Conspiracy that would lead me to the same conclusion about the anti-fat scientists of the mid-to-late 20th century. I also don’t agree with Pielke’s ascribing of Manichean Paranoia to CAGW skeptics. It sounds as if he’s trying to put himself above the fray intellectually, perhaps so that he may choose to be in the winning corner when only one fighter is left standing. CAGW skeptics don’t feel “enlightened”; They feel threatened. Just look at the stakes. It’s a historical discussion of conspiracy theorising in American politics. It’ll be interesting to see what Roger Pielke does with it. Let us not forget the history of Progressivism. They are the ones who pushed Eugenics so hard using many of the same tactics the progressives use today to promote AGW. Thankfully, science finally silenced Eugenics. Progressives need to be stopped, taken down and exposed for the Fascists they are. The two sides cannot be equated. The alarmists (aka warmunistas) have no evidence to support their thesis. As the ClimateGate emails show, these folks used the numerous taxpayer dollars to enforce censorship of opposing views, among other things. For skeptics to respond hardly equates to what the alarmists have done to science. Geronimo. Thanks for posting that Guardian article on sugar vs. saturated fat. Really excellent read and an eye opener on how scientific consensus can be a malign and destructive influence which works against the common good. Reducing cholesterol is still government advice and GP’s get financial incentives I believe for getting people onto statins. Statins bring mega bucks to the pharmaceutical industry, yet have many side effects that are dismissed by the medical establishment. This article from 2005 by Dr Malcolm Kendrick is a good primer on the whole issue and also shoots down the “good” and “bad” cholesterol idea, probably a parallel to the “luke warmer” position on climate change. All emergent strong cultures develop some Manichean type effects to a greater or lesser extent. Depending upon the relative constraints and (emotive) appeal, such cultures may end up modest in scale and narrow in scope (e.g. the saturated fats consensus Geronimo mentions above – which scale doesn’t always mean the consequences are trivial), right up to global and much wider in scope (e.g. the major religions or current calamitous climate culture). But the underlying mechanisms are the same for all. Those mechanisms come from our evolutionary past, and for instance enable in-group altruism and out-group competition via signaled social identity, leading in the worst case to the kind of highly polarized attitudes noted by Geoff above from Hofstadter’s quote. And mainstream strong cultures throughout history appear always to trigger widespread innate skepticism in host societies, a balance against cultural excess yet also a focal point for opposing culture. Most science gets done beneath the radar of significant social notice. Yet for science with high (or merely perceived high) impact upon society that hence does get noticed, this is very fragile compared with these long evolved and powerful mechanisms, so it is easily warped or derailed. Ironically, the increasing profile of science in recent decades will make this problem worse. Science may indeed be self-correcting, but this can potentially take generations, and some cultural diversions can cause a lot of damage in the interim. Life would be so much simpler if the flawed theory that CO2, as a well mixed gas, forming 0.04% of the atmosphere, was able to warm the planet beyond control, was simply abandoned. “The issue of emissions targets is based on the belief that carbon dioxide emissions from industrial activity affects global climate and that, by limiting these emissions, we can ameliorate this effect. While this belief is held by many scientists, no scientific evidence has yet been found to support it despite the billions of dollars in research funds that have been spent on it over the last 30 years. On the other hand there are a number of observations that indicate that it is not true. “Temperature doesn’t infinitely rise, however, because atoms and molecules on Earth are not just absorbing sunlight, they are also radiating thermal infrared energy (heat). The amount of heat a surface radiates is proportional to the fourth power of its temperature. If temperature doubles, radiated energy increases by a factor of 16 (2 to the 4th power). But of course “The Science is Settled” as of at least 20 years ago. Am I demonstrating Manichean Paranoia by not accepting the prevailing wisdom? Len showed up a serious discussion totally unprepared to participate. RJP’s fallacy is applying what is in effect a false equivalency between climate fear extremists and skeptics. Consider a contested issue which features a largely evidential position, E, opposed mainly by, say, religious believers. The religious side has a strong cultural alliance with a political party, X, which hence is pulled in for that side. This sparks a reaction whereby X’s political opponent, Z, weighs in on the evidential side, yet by default not with evidential arguments but instead deploying their regular range of cultural weapons, such as ‘folks who support the X party (or via association oppose E) have inferior brains’, which range will typically include some conspiracy theory, logical fallacies and so on. Hence the ‘right’ side ends up inextricably tangled with various cultural promotion and defensive behaviors. So for the climate domain in the US, calamitous climate culture has an asymmetrical alliance to political cultures, being much more strongly aligned to the Dem / Libs. Hence the Rep / Cons are largely triggered to oppose calamitous climate culture, yet frequently do so with their normal cultural arsenal rather than arguing the evidence. (And Dem / Libs sometimes use their traditional cultural arsenal rather than primarily climate cultural devices from their strongly allied cause, even while theoretically arguing within the climate domain). However, the culture on the evidential side is not skeptic fostered, but Rep / Con fostered. Yet both sides indeed feature strong cultural behaviors. In recent years there is similar polarization in Oz, and Pielke is right that this effect tends to obliterate real debate. I don’t think he is implying that the cultural muscle piling in on the skeptic side invalidates their original scientific questions. Yet I think his recommendations are naively framed, and he hasn’t considered what is happening in countries where it worked out that there is *not* heavy political polarization triggered by the issue. For instance the UK, where all the mainstream political parties support orthodox climate change policies. While cultural polarization tends to obliterate real debate, i.e. one where the real issues get discussed not the wild cultural perceptions, there is at least a debate even if it looks more like a war. In a country like the UK where calamitous climate culture has a strong alliance with *all* of the political parties (albeit it is a bit stronger for the Lib Dems and a bit weaker for the Conservatives, with Labour maybe in the middle), then essentially, there is no meaningful debate that could influence policy, and this is arguably an even worse situation. Ideally, reason should win the day and one can certainly never recommend against it. But the world is not ideal and it is hard to avoid the conclusion that the juggernaut of Trumpian politics has done more to introduce reality to the climate domain than any prior and much more nuanced / reasoned approach, as presented to any governments or other bodies advocating the cultural certainty of imminent calamity. Whether we like it or not science issues becoming for whatever reason socially contentious, are deeply entangled with cultural mechanisms. Pielke’s recommendations acknowledge this (via his Manichean theme), yet *only* acknowledge this. Culture cannot simply be tossed aside because some folks, even very many folks, know that it is present, or indeed dominant. This has been known of for years, even by many on the orthodox side of the climate debate. Pielke’s talk has also been discussed approvingly (“Lets’s listen to him”) by Larry at his Fabius Maximus site (mirrored at WUWT), and more critically by Shub, who is concerned at the vagueness of Pielke’s proposed policy solutions. The video is now available, see update above. Agreed with Andy above. There are reasons why culture gets entangled with supposed ‘scientific’ issues and these cannot be magicked away with a wave of the pragmatism wand. In the climate debate, the alarmists/consensusists are the original and only claimsmakers. Skeptics only question. In the US, at the political level, too, the alarmist camp makes Fabian progress via the UNFCCC mechanism puncutated by occasional jumps (Rio, Kyoto, Paris). Their political opponents *do not propose legislation or executive measures of their own*. Their activity is always secondary and reactive to what the alarmists do. However, the Manichean paranoia notion as presented by Pielke Jr does propose an element of equivalence between the two proposed camps, which doesn’t exist. The climate debate consists of two camps, if you will, with one set trying to prevent what the other is trying to do. What does Pielke propose – that skeptics try to occasionally allow things to progress to prove they are not ‘paranoid’? In all fields of politics and engagement, proponents try to demonize, denigrate and in some form eliminate objectors from their proposed path. As anyone can attest, this has been particularly true of the political Left in recent years in several fields – gaming, ‘women in science,’ immigration, etc. Climate change has been a forerunner in this regard and every day I see tactics employed (to avoid debate) that climate skeptics are well familiar with, for years. This is the baseline state and Pielke Jr knows this very well, regardless of how he may portray his own side as. Barry’s questions are at about 1:03:30 in the video. Fiona Fox (Science Media Centre) appears at 1:15:50, questioning his arguments against consensus messaging. Around 1:18 she says “Bob Ward would kill me for being here” to which Pielke replies “I invited Bob”. I think some of us are missing the point. Len – for example. Have you in fact watched the video? I appreciate that this would be unpleasant for you, because Pielke says some things that you will disagree with, However, he is looking for a way forward. Isn’t that needed? Telling people who disagree with you that they are corrupt morons does not immediately inspire them to change their minds and do what you want. A political solution requires groups of people who profoundly disagree to find a course of action that they can all support. Think combination of vectors! You don’t need to worry about losing your faith. Pielke points out that ‘climate change’ is one of the issues where discussion and gaining knowledge reinforces the opinions people start with. So ‘education’ about the issues isn’t going to change minds – or even raise doubts. Likewise commentators who deny that there is any equivalency between AGM fanatics and sceptics are missing the point. Obviously one side is right (or at least righter), and the other at least partly deluded. But they both behave in similar ways – as Pielke shows. It really doesn’t help to argue (however convincingly!) which behaves worse. The question is ‘What shall we do?”. Can we really not work out any way of proceeding which can command a wider measure of support and consent? What a council of despair. I have read of many peoples’ realization that the CAGW pantheon is founded on weak foundations as a result of their educating themselves. I have also had the wonderful experience of opening many students’ eyes, not by arguing with them, but merely by insisting they educate themselves by becoming informed about alternative explanations. It is however true that committed consensus-ites are immune, and most of the great unwashed don’t care and follow the majority opinion. Roger P has published his latest Pielke on Climate blog, in which he mentions his lecture and says he was pleased with the discussion session afterwards. He also writes about the latest data on weather disasters, which remain ‘remarkably low’, and various other interesting things like the new paper by Warren Pearce et al on the failure of the 97% message. Osseo, I watched up to the Q&A. Not at all unpleasant, I don’t know why you would think it might be. But when you ask whether we can work out any way of proceeding which can command a wider measure of support and consent, that might seem sensible, but Pielke doesn’t give any clue as to how to split the difference between one group that says there is a problem and something needs to be done and another that says there *is* no problem. It is like resolving the differences between progressives who battle the problem of health insurance to find ways to give everybody health care and those on the right who believe there *is* no right to health care and therefore there’s no problem to solve. OK, Len, glad you watched the video. I was out of order to suggest you might have problems with some of it – this was patronising – not a good foundation for reaching mutual understanding. And I take your point about diametrically opposed views – namely either there is a problem, or there isn’t. But maybe the discussion can be reframed. There may or may not be a problem with climate change, but there are certainly already other severe problems – such as poverty, disease, water supply, rising sea levels and so on. Climate change is expected to make these worse – slightly, or very much. But we have them now. Couldn’t we put more of our efforts now into the problems we already have? Then the worse they get, the better prepared we shall be. If you don’t like that idea, it’s your turn to suggest something – preferably within Pielke’s parameters? Yes indeed, we can and should address those problems now. I think you’ll find little to no resistance to that on my side of the climate argument. On yours, I’m not so sure. Kudos to Len and Osseo for following Pielke’s first recommendation! Do we (lukewarmers or those with more fundamental doubts) – or any or if so which of us – conform to Len’s prediction that we are against any (or some and if so which) efforts to reduce current ills, that ‘climate change’ (we are told) will (or may) make worse? Some may say that there is no need, as the evidence that cc will have significant impact is insufficient, and we shouldn’t spend unnecessarily. But given that there is such a strong will to spend money on doing something (or as a minimum on being perceived to be doing something), wouldn’t it be better to spend it on something that could offer both immediate and future returns rather than being limited to speculative returns decades or centuries into the future? Apologies for this clumsy attempt to draft interrogatories! I think the suggestion was that we “put more of our efforts now into the problems we already have”. I’d be pleasantly surprised if nobody here objected to that wrt problems in poor countries. In my mind (I may not have expressed it well) the suggestion is not that we unconditionally put more effort into problems we already have (which some may reject – possibly -on the basis that we are already doing enough, or there are better uses for the money) but that we *divert* at least some of the money currently being put into mitigation towards problems we already have? That might indeed be a better use of our money. But can you give some concrete examples of where we should spend a few billion each year. You’d have to get them past those on your side who perhaps want to cut foreign aid. To give some help, I’d suggest the West should aim a lot higher than 0.7% of GDP and should open its markets and wallets to poor countries that meet certain strict standards of democracy, transparency and lack of corruption. Excellent, Len! That question is right on point – can I give you an adequate answer? I hope what follows is not too inflammatory. Start with basics. It is powerfully urged that we must tackle climate change because it will hit the poorest hardest. Yes. The richer you are, the more options you have to avoid or compensate for the evils it may bring. Being poor means being at least relatively powerless in the face of every problem – the richer you are, the better your chances to survive and even prosper. Resilience – in the face of shocks of all kinds – increases with wealth. So, if we want to improve the lot of the poor (as I hope most of us do) we should seek to make them richer. Grow the world economy – particularly of the less developed world (how best to do that?). And avoid actions which impede economic growth. Cheap energy enriches the poorest most. You suggest that increasing the target of 0.7% aid could help – also that some sceptics may resist this. And I’m sure that some will indeed be sceptical about it. The developed world could certainly afford more. But is this the best – or even a good – way of doing it? The 0.7% measures input, not output. Some of it (doubtless much less than some claim) goes straight into the back pockets of local bigwigs. Even what does not is not necessarily helpful and may even be actually pernicious. The aid (perhaps) is assigned, as the providers require, to low-carbon methods of producing intermittent energy, when what the locals need much more is a reliable source of cheaper energy, powered by fossil fuels. Personally, I will argue for concentrating on trade rather than aid. So I’m right with you on opening markets. Trade benefits both parties, and makes both richer. Nevertheless there are certainly good projects that require subsidy – as well as projects that are definitely harmful (not that there will be full consensus on which is which). Great work has been done on malaria. More is needed on vaccines. What about flood prevention and control? Freshwater supplies? Crops adapted to heat and drought? For a worked-out list of what might be done (in preference to spending on mitigating emissions) I suggest Lomborg’s Copenhagen Consensus proposals. Lomborg’s thesis – that environmental problems are not as bad as we sometimes make out – is of course not universally well received, but still! But you have not given any examples of where we might “*divert* at least some of the money currently being put into mitigation towards problems we already have”. And if you mean by “Cheap energy enriches the poorest most” that it is the most effective method to help the poorest people (after all we all should know that energy subsidies are captured mostly by the rich), then that might be true, but I can imagine several factors that might be equally important, such as peace and good governance. If you are a coal evangelist, then by all means add your donations to that of your fellow friends of coal and support the numerous coal aid programs that provide coal power to poor countries. They will be expert at building coal generators, power grids, coal import terminals and transportation, and they’ll know how to stop the electricity and the wires being stolen and how to prevent the rich from capturing the subsidy, how to ensure efficient use of that cheap energy (I wish they’d share that knowledge around) how to prevent blackouts and intermittency (the very thing coal is touted for). Well ok, I made that up. I don’t think such programs exist outside of governments, but you might wonder why. Could it be that the supposedly cheap energy from coal isn’t really so cheap? And isn’t really so non-intermittent. It is only the marginal supply, the extra GW on an existing system, that has such characteristics. So everyone wants a washing machine. That changes nothing. It is perhaps ironic that the Google advert at the end of your clip has the narrator pleased at helping his friend design a wind turbine for his local school. Not what you wanted perhaps. Is the Ugandan correspondent for real? He’s well enough educated and connected to write an anti-environmentalist article and yet thinks he’s suffering from a malaria ‘virus’. He’s doubtless right that more could be done against malaria, but if his government spends only $10 million on malaria control in a country where malaria is one of the biggest causes of death, or 27cents of $700 GDP per person, who’s fault is that? As for electricity, Uganda has a working system with mainly hydro and some thermal. If a thermal coal plant could be built and run profitably, someone would probably have done it, so he’s asking for you to subsidize it. Coal has a long history of subsidy in the UK so maybe you are cool with that. So how much should we give and for how long? You maybe have to get the coal up through Kenyan ports, so add that in. And add a sensible amount to increase malaria control at the same time, since the Ugandan government clearly won’t. Give us a figure for your/our generosity. Actually, what’s selling like hotcakes throughout the developing world are air conditioners. As for coal plant subsidies, since USAID, the World Bank and IMF have been successfully talked out of funding coal plants by green organizations, creative funding is pretty much necessary. Wonder if Uganda’s tried crowd funding? What a nasty inhuman comment from Len. > So everyone wants a washing machine. That changes nothing. What do you mean it changes nothing? > Is the Ugandan correspondent for real? No, clearly you’ve exposed him as a fake, who’s never had malaria, probably a shill for the oil industry, just because at one point he uses the word ‘viruses’ as many people do. That’s not his complaint. I’ve already quoted his key paragraph, which clearly answers your question of how money could be diverted. I’m not giving any figures, or offering any opinion, other than that I think we should pay more attention to what people in countries like Uganda want, and less to pontificating western hypocrites who tell them what they should want. What difference do you think it makes, Paul, whether people want electricity for washing or lighting, refrigeration or pumping water (the latter 3 being more important in my experience)? Would decisions to provide it depend on such desires? That would be strange, indeed. One of your man’s complaints, which you quoted, was indeed, “We worry about dying from malaria.” so his government spending only 27c per person should concern him. Whether supplicant countries get what they ‘want’ is always slave to what the donor is prepared to provide. Find another donor if unhappy, someone with deep pockets or lots of coal to offload, maybe. That’s the problem with aid, Len. :People tend to get (some of) what donors think they should have. Trade gives people (some of) what they think they need. Peace and good governance are desirable goals – well worth spending money on. But I’m not sure how to use money to get the results sought. Nor am I at all convinced that what is being spent (and is ;proposed to be spent) will have any useful (or indeed any discernible) effect in abating global warming. You won’t hear me (or probably many others on my side) arguing against trade as a better alternative to aid. But trade doesn’t have to mean Africans selling their wares in Tesco or GAP; it need not be international to be beneficial. And the poorest may have little to sell and little money to buy, so maybe we shouldn’t rule out aid. You still have not given any examples of where we might divert money from mitigation towards problems we already have. It would be nice to get some concrete examples from you. And it would be nice to see you acknowledge that energy subsidies are captured mostly by the rich – that subsidizing projects to make energy cheap for the poor means giving a lot of money to the non-poor. You could even be braver and acknowledge that centralized coal may not be the best way to help poor people. The naive “do you want a washing machine” (or better “do you want a fridge”) question is like asking would you prefer wealth to poverty. But ask yourself whether you would like a state run solution imposed by your possibly-corrupt central government with loans from foreigners that buy facilities that suit the elite, that need imported coal to run and that will benefit the rich long before the rest of society, and before a two-core wire makes it all the way out to your village; or would you like one in which your community gets a limited but locally controlled facility in which the benefits can be shared more fairly. In the former, the poor will run a single light bulb and the lucky few maybe a fridge, while rich will buy Tom’s air-conditioners and Paul’s washing machines and lights galore and demand will rocket to the point of power cuts and intermittent supply. In the latter people install efficient appliances and cooperate to get the best use from a shared resource. Of course if you are in the group that would benefit most, like Paul’s correspondent, the former is preferable, but it is not clear to me that the latter is necessarily worse in the more realistic situation where the central system is years overdue, the politicians have stolen the money, the bureaucrats are too inefficient or ignorant to get the thing running, the technicians have gone back to China or the coal is stuck in a port in Kenya or at the border awaiting payment of duties. The first half I entirely agree with – energy subsidies are captured mostly by the rich. The problem – in the UK at least – is that those energy subsidies are subsidising unreliable “renewables” which make energy expensive for the poor. I am a broken record on the subject, but that is because nobody has answered my question to my satisfaction – why do political parties in the UK, which claim to be left-of-centre and to support policies aimed at helping the poor (Labour, Lib Dems, Greens, SNP, Plaid Cymru), continue to give unquestioning support to energy policies which see the poor subsidise the rich? Mark, I was talking about the developing world really. But the principle that subsidies are captured by the rich applies equally to rich world countries. It has to, except in the case of per-capita payments, because the rich consume more. You emphasize the unreliability of renewable energy, but reliability is a relative thing. Coal power is reliable in a rich world setting where it is surrounded by grid management that smoothes out supply trips and demand variations with demand response and pumped hydro and even batteries, in a system where demand growth is not exponential. In a poor world system where demand often outstrips supply, efficiency standards are low or absent, theft and blackouts are common and the problems I listed before are present, ‘reliable’ coal is not really as reliable as you might think. In that setting, having a small solar/battery system that provides enough for each person in a community to run a low energy fridge, some LEDs and a phone charger would be preferable to intermittent ‘plentiful’ supply of a grid system. That is not a popular message here, as the lack of response Osseo or Paul perhaps shows. As to your question, I don’t know the answer. It is not just in the UK; in Germany the Energiewende is supported by the left as well, perhaps because it was, at first at least, seen as a way of returning control to community level, allowing communities to generate their own power and escape big utilities. My suggestion, as I think I’ve said before, is that domestic pricing should be be inverted. The first (say) 100kWh per month should be charged at or near cost, the next 100 at a higher rate etc upwards. This allows the renewable energy subsidies to be recouped from those who use most. Thank you for your thoughtful response. I don’t know enough to comment on the sense or otherwise of the numbers you quote in your last paragraph, but in principle I agree with the sentiment. I am not hostile in principle to renewables, though I don’t like to see my beautiful visual environment blighted by wind turbines and huge solar parks. I also have doubts about the viability of wind in the UK, when the windiest places tend to be far removed from the bulk of the energy users, so large amounts of energy are lost in transmission; and where I live the idea of solar is a joke, especially in winter, when we have most need of plentiful and reliable energy sources. On the other hand, solar power in a sunny sub-tropical country might in principle be a good idea. My preference is for ideology to go out of the window and common sense to take centre stage. Solar clearly is sensible in reliably sunny areas. One would have to be stupid to build new fossil thermal capacity to supply midday peaking demand in such places. That is just common sense, not ideology. As for northern areas, the negatives of fossil fuels make reducing their long term use common sense there too, irrespective of cutting carbon emissions. What negatives Len? We use fossil fuels because of the positives – high energy density, low cost, ease of transport, abundance. Human progress has been marked by the use and displacement of hydrocarbons by better alternatives – wood, then coal, petroleum and finally natural gas. For the first time some societies are proposing to replace our current efficient fuels with inferiors, leaving much fossil fuel wealth in the ground, all because of an unproven and failing theory.. Stupid! It has always been accepted that much fossil fuel will be left in the ground, Alan – resource vs reserve. It depends upon prices. There’s plenty of coal ‘wealth’ under England but nobody will mine it any more because the price is too low and the subsidy has gone. Of course, if you can persuade lots of developing world countries and even rich countries to lock themselves into using coal for electricity generation, the more inefficiently the better, you might be able to move some coal seams from the resource column into the reserve column and increase the ‘wealth’ of whoever owns and extracts it. If you can kill efficiency standards you can move even more between columns. That persuasion is basically the hobby you and your fellow “skeptics” have dedicated yourselves to with some success for the last two decades. Kudos to your efforts. Matt-king-coal doubtless thanks you. Like most things, fossils have negatives. We’ve discussed them before – or rather people like me have discussed them and you all have done your best to ignore or dismiss them. Combustion products in cities? No problem, you don’t live in polluted areas. Pollution of seas and beaches? No problem, it is a long way away. Corruption and overthrow of foreign governments, decades of suppression, war and destruction in the middle east? Big deal, we got *our* oil and gas. We found it, we don’t care what it takes to get it. Electrification has all the advantages and more that fossils have, only energy density in batteries is lacking and that will come or be worked around. Southwest of Bihar, the state of Maharashtra supplied rural villagers with solar equipment in 2012, but many of those arrays have fallen into disrepair, Bloomberg reported earlier this year. Paul, try running a fridge on a grid system that is up at unpredictable times for only a few hours a day, like Bihar in Greenstone’s talk. I used to be a big fan of Len Martinez’s dual-tariff-with-first-tariff-cheaper electricity idea but subsidized domestic rooftop solar has complicated things. If you’re fortunate enough to have a roof and, on it, this expensive subsidized thing that reduces your total grid usage and therefore your second-tariff usage then you’re being doubly subsidized by less fortunate people, no? Here in the UK we might soon be trying to run fridges on a grid system that is up at unpredictable times for only a few hours a day, unless we adopt a more sensible energy policy than that currently on offer with our drive towards renewables. We’ve already experienced brownouts last winter. The capacity of the grid was greatly stretched, and we’re reaching the stage where what is left of our industry might be paid to shut down for periods, due to lack of power, in order to avoid the reality of the situation dawning on domestic consumers by it hitting them in the face in the form of power cuts. Do they have a proper grid in Bihar or is this more junk thinking from the junk thinker? Vinny, I envisaged more than two tiers with the lower tiers not providing a subsidy, but just being cheap – maybe at cost, no taxes. But you are right about panel owners. The only consolation is that they’d be getting bugger-all solar power in peak consumption winter months anyway. Mark, I’ve seen alarmist warnings of looming black/brownouts from climate skeptics for years now, but did not know they had occurred. When and where were they? We had a few brownouts where I live in Cumbria last winter. I experienced them myself. There have been no blackouts yet, though the National Grid is increasingly stretched. If I remember rightly, Paul Homewood had a piece on the looming shortfall a few months back, and it’s common knowledge, I believe, that industry is being offered money to switch off its demand when the situation is tight. I’m going to be out today, but I’ll try to find some references this evening. There’s always a looming shortfall, it seems. Did your brownouts last long? As for voluntary demand reduction, if a company can make more money by turning off demand for an hour than by using the electricity, that seems a win-win. It would be stupid to scramble to find expensive extra supply for a few hours when there is load that would be happy to be shed for less expense, don’t you think? ” if a company can make more money by turning off demand for an hour than by using the electricity, that seems a win-win”. For the company perhaps, unless they are facing production deadlines, but someone’s got to pay. Guess who? Perhaps those “hardworking families” of political myth. My planned day out has just been a morning, so I’m back. I thought we were having a sensible discussion, but your last post has rather bemused me. Apparently power shortages aren’t a problem in your world? Shutting down industry as a consequence is a “win-win”. “It would be stupid to scramble to find expensive extra supply for a few hours…”. We didn’t need to shut down at all, and we didn’t need to look for expensive extra supply, before we went “green” and shut down our coal-fired power plants, relying naively and expensively on wind turbines and solar panels to fill the gap. Britain should brace itself for a winter of tight electricity supplies that will force National Grid to use its last-resort measures and push wholesale prices up, according to a new analysis. Figures from Enappsys, which monitors wholesale electricity market data, show the grid will have an even more difficult job keeping the lights on than last year, when it took new emergency measures for the first time. As electricity supplies have become tighter in recent years, the UK has sought to increase imports. I’ve just read the automatic copyright warning that came through with that post. I didn’t intend to breach copyright. If the owners of this site wish to take out the cut and paste, and just leave the link to the article, that would be appreciated by me. Sorry. Thanks Paul – much appreciated. Alan, a plant facing production deadlines would very likely NOT make more money by turning off demand for an while than by using the electricity and therefore would not offer to do so. You are not thinking straight. You are free to think that generators should not be limited in their mercury, SO2 and NOx emissions, of course. Personally I think they should be. It is only people like you who talk of “shutting down industry”. I don’t understand it. Can you really not conceive of a facility, factory, office etc in which they could profitably kill a proportion of load on a winter evening (turn off alternate lights in a warehouse or car park, shut off some refrigeration for 10 minutes, slow down the heating rate of a vat of gunk, whatever)? Len. Try reading for content. A) if a company had production deadlines they would oppose being shut down but B) if deadlines were not imperative, they might not oppose being shut down but would probably still demand compensation. So it’s we poor saps that ultimately have to pay the compensation. Try reading for content, rather than for material to oppose (almost by reflex). I know you don’t understand it – that’s part of the problem in trying to have a meaningful online conversation. Yes, of course I can “conceive of a facility, factory, office etc in which they could profitably kill a proportion of load on a winter evening (turn off alternate lights in a warehouse or car park, shut off some refrigeration for 10 minutes, slow down the heating rate of a vat of gunk, whatever)” but that is only a small part of the story. Did you read the FT article or any of the numerous others which are on the internet? Are you really not concerned about millions of people in fuel poverty being forced to pay for more expensive energy while wealthy landowners and multinational companies hoover up the subsidies at their expense? Can you not conceive that we are heading for huge problems in the UK by closing down reliable and predictable power stations and replacing them with unreliable and unpredictable alternatives that cannot meet the continuing demand for power? Where I live it can be bitterly cold in winter. Are you really happy that there is a risk (however small, but a risk that did not previously exist) that old and vulnerable people where I live may find themselves without heating on a bitterly cold night? All people like me try to point out to people like you is that however desirable it is to clean our atmosphere (and like Tiny CO2 I’m not referring to CO2 here), we need to be realistic about how we achieve this and we need to ensure a functioning power generating system. You seem to be in denial about the problems associated with closing down fossil-fuel plants while not replacing them with adequate nuclear generation and relying on sun and wind to fill the gap. You might feel able to ignore the problems and keep yourself warm with wishful thinking, but our politicians should not have that luxury. They should be held to account on this vitally important issue. Len almost gets there. So the plants were closed and now we run Diesel gennies instead. Problem solved. And why not just point out that UK nox emissions are not a problem. They are lower than mandated, at least. The same probably applies to sulphates but why do research to argue with clown dancers? Alan, you don’t seem to get how it works: ” …they might not oppose being shut down but would probably still demand compensation”. There is no demanding and there is no being shut down. The scheme is voluntary and compensated. As for it costing someone, the idea of shedding load is that it costs less than bringing on peaking supply, but you seem to prefer the latter. Oh I know you’d rather we hadn’t closed down the existing stations, but we did, so the question is how best to deal with the consequences. Mark, the above perhaps applies to you too. Also you didn’t comment on whether you think that coal generators should or shouldn’t be limited in their mercury, SO2 and NOx emissions. It was the failure to meet the new limits that caused their closure, so how would you have set the limit levels differently? As for old people heating their houses with electricity, is that common in Cumbria. I’m fairly sure it is not in Germany (unlike France where it is), whatever Cat may think. ps. maybe your brownouts were only voltage sag if they lasted only briefly. The clown is still dancing. MIB, yes, and don’t forget, the needs and wishes of poor, suffering people in India and Africa being ignored. Len. Methinks it’s you that do not understand. If its voluntary as you seem to believe then it will be totally unable to protect us from brownouts and blackouts. The only firsthand experience I have involved a glass sand manufacturer in Norfolk who used large amounts of electricity for the final stage of iron oxide removal to achieve the white sand final product. The manufacturer had an agreement with its electricity supplier only to use power during off peak periods. This wasn’t voluntary; if agreement wasn’t reached, no electricity would be provided. There is nothing voluntary, as users you accept their terms. You can apparently insist your supply come from green sources (in which case I have a bridge to sell you) but try buying only dirty fossil fuel electricity. Alan, look at http://www.kiwipowered.com/ or any other demand response aggregator and tell me how participation is not voluntary. Or don’t and stay happy with your preconceptions; I don’t care either way. Paul, people in India are short of power because of half a century of more of bad government, nothing more. Oh my Len, 650+ sites signed up including Colchester Hospital (I can just see them cutting their demand during a medical emergency or during the possibility of a brownout). Well we can now rest in our beds safe in the knowledge that 650+ sites will give up their needs so that Len and his ilk can push their stupid message about electricity supply assurance using renewables. I can only assume there are different universes and Len and I don’t share one. Sure, Alan, the hospital laundry has an emergency load of soiled bedsheets and can’t possibly shed load for an hour or two! Not only didn’t you know about demand response aggregation, you don’t have the degree of imagination needed to think how it might work. So what exactly is it about having diesel generators or extra spinning reserve sitting expensively waiting to kick in at peak demand that you think is better than voluntary reductions in peak demand? Len. I thought the answer is obvious. It’s small beer, laudable as far as it goes but of no real significance. You’re making a fuss over very little. Betcha Colchester Hospital has diesel generators in reserve, despite what you say. “…people in India are short of power because of half a century of more of bad government, nothing more. Nothing more? What? 150 years of rule by various Emperors and Empresses of india left them with a perfectly decent power system which they went and ruined with bad democratic government? Geoff, it doesn’t take long with good government. Europe rebuilt itself in a few decades, South Korea and Japan too. With Marxism or socialism, all bets are off, of course. Alan, you’ve gone from not knowing it existed to belittling it. That is intellectual progress, of sorts, I suppose. Well done. Mark seems to have disappeared rather than answer whether coal generators should or shouldn’t be limited in their mercury, SO2 and NOx emissions and how he would have set the emission limits differently. And I’m not hopeful that Alan will answer what it is about having diesel generators or extra spinning reserve sitting expensively waiting to kick in at peak demand that is better than voluntary reductions in peak demand. But you are amongst friends. It is okay to say “I love the coal, oil and gas barons”, really. Go on, you know you want to. Len. “We can take offline around 200 megawatts [enough to power 100,000 kettles] from our participating customers almost at the flick of a switch”, Ziko Abram (head of Kiwi Power). This looks impressive but 1) requires all 640+ participants to agree to shed all their demand at the same time, and 2) its not new sources of energy, its payments to those 650+ for not using energy and getting paid to do so from the National Grid. Guess where that money comes from. It seems to me to be a “shuffling the deckchairs” type solution. Yes I acknowledge I was unaware of Kiwi Power (it started in 2009), but I could not easily find if the system has ever been used, but I shall avoid staying in Marriot Hotels in future in case they voluntarily cut my heating and lighting because Kiwi Power asked them to. I hope never to have to use Colchester Hospital for similar reasons. Geoff, it sounds to me like Len is calling for a return to the good old days of the British Empire! I’m rather disappointed that you think I’d disappear rather than answer your questions. Some of us have a life to lead, and can’t spend all day hooked up to the internet. Not all of us have smart ‘phones and tablets so that we can check our favourite websites every few minutes. I was away from home all day yesterday from early in the morning until late in the evening. I did not access the internet at all yesterday. So, we in the UK cut our energy-generating capacity, and have to reach voluntary agreements to cut energy use, while exporting our industry and CO2 emissions to the Far East, where they have far lower environmental standards (and if the latest BBC news report can be believed, can’t be trusted to report on their emissions accurately anyway). Along the way, we expose our old people to freezing to death, while reducing our tiny (compared to India and China) CO2 and other GHG emissions, while they increase theirs. Hardly a win-win situation, more of a lose-lose I would have thought (unless you live in CHina or India, of course). And you clearly are in blissful ignorance regarding rural life in places like Cumbria (and in other rural areas of the country too). Many people here can’t access gas. Some houses which can’t access gas have oil-fired central heating, but many others – usually the unmodernised ones, occupied by elderly people – are indeed dependent on electric for their heating. As we all will be in the not-too-distant future if the authorities get their way in their quest to turn the UK into a “green” Nirvana setting an example to the world. What then? All your voluntary temporary shut-downs in the world won’t make any difference to a desperate power shortage at that point. And I think I’m still waiting for you to answer my questions from my post at 6.48 pm on 8th August. For the avoidance of doubt, I have another busy day ahead of me, so can’t promise to respond promptly to any response you make! If, instead, some more expensive spinning reserve was installed and switched in just to provide peak demand, they would also be “getting paid [more] to do so from the National Grid”. Guess where that money comes from. It is as if you have a fetish for adding supply even if it costs more. Maybe that is why we were able to close 11+ GW of generation, 20% of installed capacity, and essentially nothing happened; we were vastly oversupplied because people like you believed we had to build extra capacity rather than find more imaginative solutions. In any other sector of the economy demand management is unexceptional. Only in electricity supply are we supposed, according to you, to believe it is wrong. Mark, sorry to have doubted you. Energy companies had a choice between closing down old plant and bringing it up to EU standards. That they decided to close 11+ GW despite knowing, as we all do, that in the long term electricity demand will rise significantly, maybe even by 11GW. That might be because they can’t compete with subsidized solar and wind. But equally, coal doesn’t seem able to compete with gas or imports (if it could we’d be burning coal instead of importing 2GW more or less continuously). As for poverty, from you 6:48 and today, of course that bothers me. But addressing poverty is the job of the welfare system. I’d be happy to pay more for electricity and gas if companies were required to use that extra money to help vulnerable customers insulate their houses and use low energy lighting and appliances. How about you? Len. Unless I have misread the advertising literature there is no commitment to withdraw demand when asked to. If its all voluntary and the participants continue using electricity there will still be a need for a reserve. Kiwi also get paid for other people reducing their demand. Good for them, but for reducing fuel costs, forget it. Len – I owe you a reply to this comment: “You still have not given any examples of where we might divert money from mitigation towards problems we already have.” My problem is where to start. I am not tremendously well informed about mitigation programs, but I have yet to hear of one which seemed to me worth the cost. Of course, I’m sceptical both about whether they’re needed and whether they’re likely to work – so my evaluation will differ from yours. Maybe you’d like to nominate your best-value mitigation scheme? Meanwhile I’ll offer one small suggestion of my own. I’d stop paying home-owners who’ve installed rooftop solar panels premium prices for electricity they deliver to the grid, and use any savings to subsidise poor consumers. Len, thank you for your gracious apology, which I happily accept. It is a pleasure to debate with you, and you are a skilled debater, IMO. Much of your thought processes I can endorse (avoiding pollution is good, avoiding unnecessary waste of anything, but particularly of energy, is sensible and laudable, etc etc). However, we do seem to differ substantially over what I would regard as the bigger picture, and the reality of the situation. Whatever one’s views of the science behind AGW, it seems to me that the big issue is the inability of humankind to do anything about it so long as the population of humankind continues to increase greatly; so long as much of the undeveloped world not unnaturally seeks to develop, industrialise, modernise, and enjoy higher standards of living (whilst more often than not also becoming much more heavily urbanised societies); so long as countries responsible for significant proportions of GHGs are defined by the UN in its sundry climate treaties as “undeveloped” (and therefore exempt from any obligation to take measures regarding their GHG emissions); and so long as much of the western world, while purporting to reduce GHG emissions in reality is simply exporting them. Against that background, I struggle with a mindset which says that we in the UK should lead the way or set an example to the rest of the world (most of which isn’t interested). I struggle with the idea that it makes sense to stop burning dead trees (i.e. coal) in order to replace that with cutting down living trees to transport across the Atlantic to burn at Drax Power station, which used to burn coal mined nearby. I struggle with the mentality which is happy to see plentiful supply capacity (NB capacity, it doesn’t mean we have to use it if we have no need to do so) eroded to the point where people are paid to switch off demand, because margins are so tight; I struggle with the mentality which is happy to replace reliable energy generation with unreliable generation, at significant cost. I struggle even more with the mentality which is happy to do that at the same time as insisting that we have to replace petrol/diesel vehicles with electric ones and replace gas in kitchens with electricity, without a coherent plan to supply the electricity which will thus be required. I don’t accuse you of all of those characteristics, not least as your comments can on occasion be somewhat elliptical, but I’d say, based on what I’ve read from you, that you’re in that ball park. I would say that passing responsibility for poverty from an energy system which exacerbates it, on to the welfare system is remarkably glib. I take a rather more holistic view. I also think that the view that paying more for gas and electricity is fine ” to help vulnerable customers insulate their houses and use low energy lighting and appliances” is somewhat naive. I confess I’m not happy with that as an approach, for the simple reason that it won’t work. Most of the higher prices go to subsidise wealthy people exploiting the subsidies that are on offer, for a start. Some of the insulation systems on offer have proved to be a bad idea – the pushing of cavity wall insulation, for example, where a large number of properties have ended up dripping with condensation and causing health problems. I simply don’t trust the powers that be to ensure that such money is well-spent, and I have no doubts regarding the ability of dodgy people to smell the free money and try to take advantage. And finally, many of the most vulnerable will simply slip through that net of house insulation and low energy lighting and appliances. Your sentiments are honourable, but in the real world I fear the plans you espouse won’t work, and the better idea would simply be to avoid unnecessarily increasing energy costs for those who can least afford those higher costs. Mark I wish I were able to express my thoughts as well as you express them. It is sometimes uncanny. Osseo, so your proposed diversion of resources was, as I suspected, just rhetoric. Mark, I agree with some of what you say, and disagree with some. I’ll have to give some thought to it and reply tomorrow. When I did o-level physics in the 1970s, wall cavities were something that were regarded as good because they slowed the flow of heat to the outside world. How did society move from that to a position where it made sense to fill the cavity with anything? MIAB. When I did science back in the 1950s it was much simpler still: wall good, hold up roof. Mark, I will push-back against some of your points. 1. Nothing can be done. Well that is not really true. Apart from nuclear, clean energy does exist – go stand in the sunshine (if you have any in Cumbria) to find out. Solar panels (PV and thermal) in the right places can supply huge amounts of energy. In the wrong places (Cumbria perhaps) it is not sensible (although solar water heating probably works well) but even in the UK or Germany it fits the summer daytime profile well (see https://www.agora-energiewende.de/en/topics/-agothem-/Produkt/produkt/76/Agorameter/ and turn off the non-conventional sources to see that conventional runs with little variation despite 20GW variation in demand). In sunny places, which are often poor, it could easily supply a large proportion of demand. 2. The UK is insignificant and should do nothing. That is the standard problem with a “Tragedy of the Commons” type situation. Why not free-ride. I’d like to say that’s “not really us”, but lots of people like being free-riders so maybe it is. There’s no logical argument against free-riding, which is why tragedies of the commons are so … common. Maybe the best evidence against this view is that Germany could free-ride too but chose to invest huge amounts in renewables. Its emissions haven’t fallen so much, but it created the modern mass solar industry. The current global solar industry and the dramatic cost reductions we have seen owe much to the actions of Germany, a country very similar to the UK. 4. Poverty. Is poverty. Whether it is electricity or natural gas or propane or oil that is too expensive, or rents that are too high ‘cos rich folk like to play landlord and make a good ‘return’ or the housing stock is crap and improving it would dent that ‘return’ or drive up rents or jobs don’t pay enough etc, etc. Pay the solar/wind subsidies from general taxation or cancel them altogether and you’ll still have people unable to heat their homes. What is your solution to the underlying problems? Len, thank you for dealing head-on with the issues I have presented. I find that refreshing. No doubt alarmists would say the same of sceptics, but I tend to find that alarmists (not that I have the evidence to label you an alarmist – more of a non-sceptic!) evade the issues rather than confront them. 1. Nothing can be done. It IS really true, unless the international community deals with the issues I listed as causing the Paris Accords to be an abject failure. I have already conceded that solar in the right places makes sense – I am not ideologically opposed to renewable energy. But it makes next to no sense here. To give your argument the benefit of the doubt, and look at the case for solar at its highest (summer) I see that it’s currently producing around 2/3 of the energy currently being imported through the interconnectors to fill our energy gap. In winter, when we have greatest need, it will produce next to nothing. To go down this road in the face of increasing electrification of our usage (kitchens, cars, ultimately central heating) in a country like ours, makes little sense. “In sunny places, which are often poor, it could easily supply a large proportion of demand.” No doubt, but that is not the UK. 2. Your argument doesn’t deal with the fact that we are not so much reducing our emissions, as exporting them – to countries with less rigid environmental standards than our own, so arguably we’re actually making things worse. You’ve chosen an unfortunate example with Germany, a country which – as Catweazle has pointed out – is now suffering its own energy-related poverty issues. And if you care to check, you’ll see that German GHG emissions actually rose last year. So that’s going well, then. 3. Bad planning. I haven’t checked, because I’ve barely been at home, but I’ve accepted at face value what you say about the reason behind the closure of the coal-fired power plants in the UK. That doesn’t address the issue of whether the EU Directive was well drafted, and couldn’t more sensibly have been phased in, or whether we could have adopted the wonder technologies apparently being adopted by India and China (as per their INDCs under the Paris Accords). By the way, if they’re lying about the efficacy of those technologies (surely not) then anything we do will make no real difference to anything. None of which gets round the issue that replacing burning coal with wood doesn’t make sense, nor does replacing coal with renewables rather nuclear. I’m not a fan of nuclear, but the demonisation of GHGs leaves us little choice, in my view, if we are to keep the lights on. I’d start by not adding to their problems by making their energy needlessly more expensive than it already is. The big picture remains. The rest of the world (with the exception of a few western countries) isn’t interested. Upwards of 70% of the world’s GHG emissions come from countries which are committed under their INDCs to increasing, rather than reducing their GHG emissions. It truly is pointless for us to commit an act of self-immolation, while they get a free ride. To follow up on the point that even heating water by solar will not work everywhere, all the time. When I lived in the San Francisco Bay area we installed solar water heating. This had to be shut down during the winter because of the risk of freezing in the exposed pipework damaging the system. Nevertheless the joy of having a hot shower for more than half a year knowing that it was “free” was immense. I don’t believe it ever paid for its setup cost, but it probably helped sell our house when we moved away. Houses in Athens commonly have solar water heating systems, but relatively few in those parts of Spain or Italy that I know. Things can be done, Mark. We could invest heavily in modular nuclear for example making the technology ready for the rest of the world. Same with solar and wind, integration, demand management, smart grids, investment in solar in sunny places, HVDC connections. It is not a sprint, but a 30 year marathon. Same with Germany. We should not try to be free-riders – we wont gain from sitting on the sidelines while the world adopts new technologies. You say the world wont, but over the next 20 years I think it is inevitable that all developed countries will be modernizing their generation, grids, transport and electrifying fast. The relevant EU directive was from 2007 and gave companies 8 years to phase out or adapt their old (> 20years) non-compliant plant. That seems ample time for phased implementation. That is what I said: let’s pay the solar/wind subsidies from general taxation or cancel them altogether. There will still be people unable to heat their homes. What is your solution to the underlying problems? It is not a trick question; try to answer if you are actually interested in poverty, rather than in using others’ poverty as a hammer. I don’t think I’m an old man! I’m comfortable with change. I just think – I know you won’t agree – that I’m a realist while you’re an idealist. It’s good to have talked and to have kept it civil, but I think we’ve taken it as far as we can, and I am genuinely rather busy at the moment, so over and out for now. Okay, let’s talk again soon. Meanwhile we can both give some thought to solving the problems underlying “fuel poverty”. ” just rhetoric”? I’m not allowed to think that all attempts at mitigation are a waste of time and money? You disregard my specific example? I’m not impressed. Still, I appreciate you are busy keeping up with other correspondents, so I shall make allowances. Osseo, your suggestion was actually interesting. At the moment the money paid as premiums comes from extra levies on the price of electricity (and gas?) paid by everyone. As I understand it, you are suggesting that the levies remain and the money is just redirected. The price of electricity for everyone but the poor does not change. Is that right? Or do you want the price of electricity to go down for everyone and the money to be raised through general taxation to be pumped into the welfare system? It’d be nice to know how you think that should work.